Northern Ireland rider Jonathan Rea finished a solid eighth on his MotoGP debut at the San Marino round in Misano on Sunday. 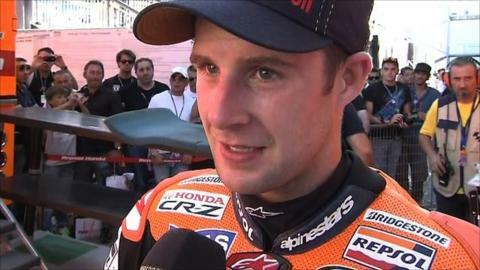 Rea, deputising for injured world champion Casey Stoner, narrowly avoided a first-lap crash which saw his Repsol Honda team-mate Dani Pedrosa taken out by Hector Barbera. However, the remainder of the race was largely uneventful for Rea. Series leader Jorge Lorenzo took victory ahead of Valentino Rossi. Rossi was second in his home race for Ducati while Briton Cal Crutchlow crashed out. World Superbikes rider Rea will also replace Australian Stoner in the next round at Aragon in two weeks. Stoner is after breaking his ankle in a crash in Indianapolis in August. World Superbikes use machines that are available to the general public, while MotoGP riders race fully customised bikes. Is Rea the real deal? Read more on Is Rea the real deal?